The Thermodynamic Block can be used for a number of different applications, but most commonly for central heating. This revolutionary technology adopts all the benefits of an air to water heat-pump, but contains panels on the roof to ensure vastly improved performance during times of good solar gain. The system can come in both a low temperature (55°C) and high temperature (65°C) option. 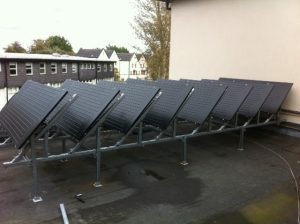 The number of panels needed on your roof will depend upon it’s size and heat requirement. It is not always essential to put the panels on your roof either. Should you have room on the garage roof or even space in the garden, there are lots of options as to where the thermodynamic panels can be located in order to take full advantage of whatever space availability you might have in your home.